Hail! We're moving on by one chapter this week. I'd intended to go further, but: a) there's so much in this chapter, b) there's so much in the next one, too, and c) I'm starting this more than halfway through the day and I still haven't yet dared to look at my to-do list. Time is a limited thing. 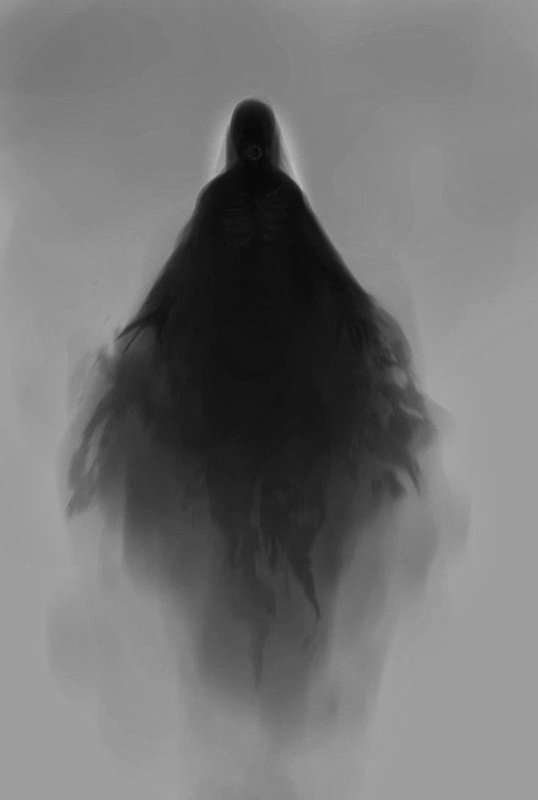 The dementors are an amazing idea. Creepy, swooping, demonic beings of darkness and filth, they are the perfect horror element - tailored to the individual and apparently indestructible. I love their role in this book - to drive Harry into a deeper confrontation with his traumatic past. But the dementors fail in one essential and deeply troubling sense. The ‘dementor’s kiss’ steals the soul of the victim. My frustration with this all-too-powerful ability of evil is that the soul is then reduced to merely a thing - something that can be taken away through no fault of the individual..and I can’t help but be disturbed by such a view of the person. I'm beginning to understand—like, not just know, but actually comprehend—why Masha disliked the books on first read, and why she has such a worldview clash with them. I suspect I lack that worldview clash myself primarily because I'm willing to let so much slide in good kidlit. E.g. : if the dementors represent depression to me at one moment, raw evil at another, the effects of giving up the battle for your own soul at another, and mere plot device at yet another, I'm completely fine with that—in fact, I favor it, because I'm not fond of getting too allegorical. It's childlike play with powerful ideas, though, taking one after another as the mood strikes. I just don't happen to mind. I'm not concerned about getting a proper, nuanced, consistent vision of metaphysical truth throughout. Not in comic children's fantasy. Rowling did include spiritual symbolism, but that's more in character growth and action than in her worldbuilding. There must have been bad wizards and witches, like our common thugs and petty criminals, who didn't care to keep their mischief confined to their own kind. But then, that's what memory charms are for, I suppose! It's an interesting thought to entertain—how often and how many times have happily oblivious Muggles happened upon magic only to have their revelations erased and their life's events rearranged for them—and how does that jive with ethics, wizards' or otherwise? That, I think, is a bit like the dementor's kiss—if you think about it in literal, real-world terms, it's not bearable. Much as most of us want to go to Hogwarts, I don't think anyone is prepared to accept the implications of the magical world. Sometimes, even with Harry Potter, it's good to be able to close the cover of the book and say, "It's just fiction." 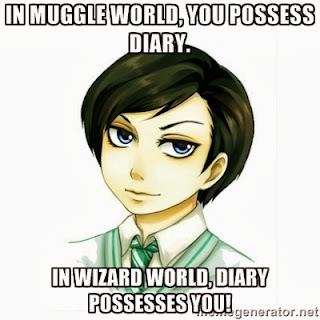 The real world is hard enough without dementors and jerks with magic powers. I blame this one on John Noe from Pottercast. He's the one who introduced a competition with the words, "Take your favorite Britney Spears song and set some Harry Potter Christmas lyrics to it..." The competition never went anywhere, but the words couldn't be unsaid. This was already in my brain. 1. Hermione's class schedule. Here there be SPOILERS. But I know exactly how she feels in blithely setting herself up with an impossible to-do list. 2. Sir Cadogan. All I have to say about him is that he's hilarious. Here's to you, sir, grass stains on your metal knees and all! A. The act. From the silvery ladder descending in silence, everything about Divination class is augmented by the creation of a susceptible mood. There are soft chairs, low lighting, heavy incense, lots of warmth, all designed to relax the mind. 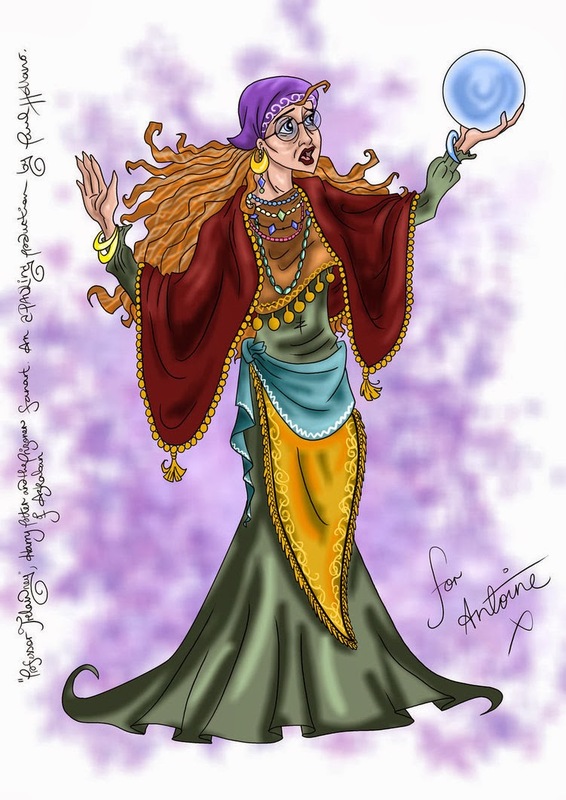 Sybill Trelawney quickly perceives Neville to be the clumsy one of the bunch, and from the beginning she makes him nervous in ways that are kind of brutal, setting him up to fulfill her own prophecies. She tosses out casual predictions, too many to be easily remembered by most of her hearers, with a confidence that the baffled, off-guard thirteen-year-olds aren't prepared to refute. 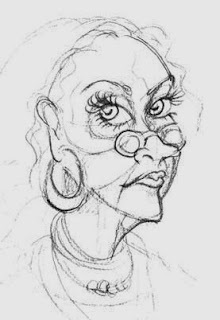 She attacks challengers flatly with the intimation that they're ungifted, and by then she's manipulated enough of her students into half-believing her to unsettle the entire class. It's quite a show. B. The humor. I got a laugh out of Harry's seeing Trelawney as a "large, glittering insect." The conversation between Harry and Ron is likewise hilarious. Student attempts to read the tea leaves mostly are, even after Trelawney has dramatically predicted Harry's death. And we're just getting started. C. The head-clearing. Hermione, rational Hermione, challenges Trelawney immediately: everyone knows that Harry has a deadly enemy. Tell us something we don't know. Hermione is well ahead of her peers, being able not only to see the act for what it is, but to call its bluff. McGonagall reinforces the rational response, conquering most of the rest of the class' confusion with the plain facts about her colleague. 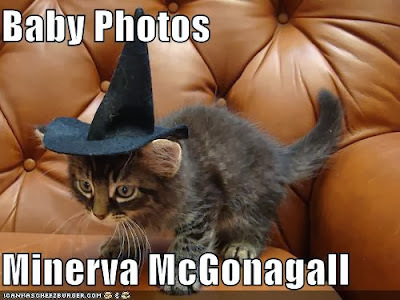 But the damage is done, and even McGonagall's combination of humor and confidence can't undo the philosophy-shaking that went on in the Divination classroom. Lavender Brown is screwed up for a while yet. The first bit on Divination, then, is a clear refutation of the idea that there's anything in the standard charlatanry primarily associated with the idea of fortune-telling. Of course, we're not through with Divination yet. On the other hand, this is ADORABLE. If you're not interested in coming up with your own Animagus form, the internet is here to help. 5. Hippogriffs. 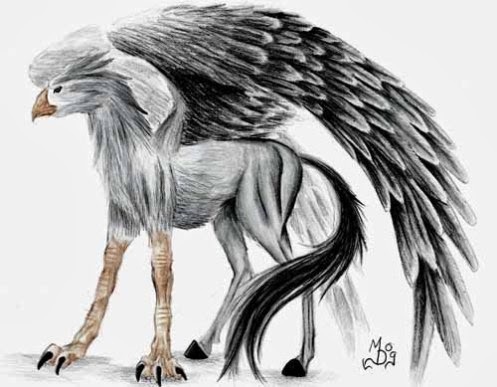 If the internet can be trusted, the hippogriff is the offspring of a mare and a griffin—which, since griffins eat horses, makes the hippogriff the Renesmee of the animal world. ;D The result, in this case, is a creature that has the front body of an eagle, the rear body of a horse, and a king's distaste for personal insults. Even shy, uncertain Neville has difficulty gaining the proud creature's respect. * Arrogant little Malfoy, of course, is a slashing waiting to happen. 6. Hagrid. Feel free to talk about him or not; I just mention him because I feel so bad for him here. Teaching high schoolers is a tough job. What a first day back in class, eh? * I feel your pain, Neville. But I'd still rather be you than Malfoy.
" If you could turn into any animal, what do you think you'd become? " Ooh..I don't know..I'm leaning toward something dramatic and beautiful...like a wolf or a raven..but I'd probably end up as a squirrel or something..or a dog like Luba - Ugh!